The Mediterranean Diet is much more than a food pattern. Besides its longstanding tradition and prized guidelines lies a valuable cultural heritage, a rich and balanced lifestyle combining popular recipes, seasonal products, celebrations and cherished culinary habits. Nuts in the Mediterranean Diet display a significant role, although there are other fundamental ingredients that cannot be overlooked. Vegetables, fruits, legumes, whole grains, seeds and olive oil are among the most recommended ingredients. Fish, eggs and white meats must be eaten weekly in moderation, and the intake of red meat and processed meat, sugar sweetened beverages and creams must be reduced. Needless to say that doing sport regularly and giving up smoking habits is very helpful when it comes to following a healthy lifestyle. As it may be observed, it is very important to give prominence to plant-based foods and monounsaturated fats. Nuts in the Mediterranean Diet, alongside virgin olive oil, are packed with monounsaturated fats and several antioxidants which may have anti-inflammatory effects, so they can help to prevent cardiovascular diseases. In addition, whole grains, legumes, fruits and vegetables contain fiber and other phytochemicals. Benefits of the Mediterranean Diet in human health are supported by comprehensive scientific evidence. In addition, research about the role of nuts in the Mediterranean Diet does exist too. According to the PREDIMED study, a Mediterranean Diet rich in plant-based foods, such us nuts (almonds, hazelnuts and walnuts) or extra virgin olive oil, and without calorie restriction, has been linked to weight loss and less gain in waist circumference compared to a low-fat diet. Results come from a large randomized trial published in The Lancet Diabetes & Endocrinology. 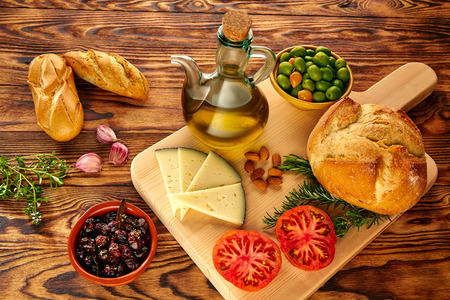 The PREDIMED study suggests that current guidelines recommending a low-fat diet may create unnecessary fear based on healthy fats present in the Mediterranean Diet. Nuts in the context of the Mediterranean Diet may help to prevent peripheral artery disease (PAD). According to a study published in the Journal of the American Medical Association, compared to the advice to follow a low fat-diet, a Mediterranean Diet supplemented with nuts or extra-virgin olive oil reduced the risk of peripheral artery disease. PAD is a condition by which blood supply to the arms, legs, stomach or kidneys is hampered due to fat being deposited in the arteries. The aforementioned PREDIMED study has also researched on cardiovascular diseases. A study published in the New England Journal of Medicine showed that adoption of the Mediterranean Diet enriched with tree nuts or olive oil decreased the incidence of major cardiovascular events, such as myocardial infarction, stroke or cardiovascular mortality, among high-risk persons. In other words, the incidence of these events and the mortality associated to them might be lower for someone joining the Mediterranean Diet supplemented with a handful of nuts a day compared to someone consuming a low-fat diet. Tell us about you! Is the Mediterranean Diet part of your eating habits?